After the rainy past week, the sun is shining again over Cancun and the Riviera Maya. The tropical storm (later hurricane Cat.1) Ida stroke the coast of Nicaragua and Honduras last Thursday. After that, it moved up to pass through the Yucatan Canal (the one that separates the Yucatan Peninsula from Cuba) bringing only some strong wind and rain during the weekend. All the alerts and the measures to ensure the security of the locals and tourists in the area were rapidly taken. For better or for worse, the experience of the authorities of Mexico in hurricanes matter is pretty wide, which almost guarantees that everything referred to security will be fine. 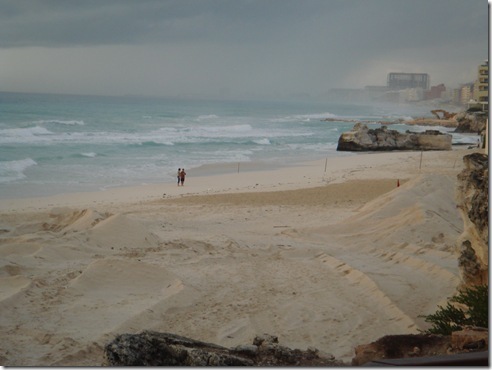 One of the main concerns in the Benito Juarez City Hall in Cancun was about the beach recovery program situation after Ida. Fortunately, as you’ll see in the following pictures, the recently poured sand is in the place and the recovery project is expected to continue in the following days. The dredge that was moved to Isla Mujeres for protection, will be back on track very soon. With 105 mph winds, Ida is now in the Gulf if Mexico heading north and is expected to strike US territory. Tropical storm and hurricane warnings have been spread out in Louisiana, Mississippi, Alabama and Florida.